SharePoint has a feature called Alert Me that allows you to subscribe to email alerts based on a variety of criteria such as when a SharePoint List item is added, modified or deleted. They differ from reminders in Outlook which you can schedule, for example to remind you of a Calendar Event or a Task due date, in that you recieve SharePoint alerts based upon a modification of an item in a list rather than on a schedule. You can either subscribe to be alerted to modifications to every item in a list or to a single item in a list. Begin by entering a title for your alert. The title will appear in the subject of the email. By default your user name will appear in the list of users and groups the alert will be sent to however you have the option to send alerts to other users or groups. When adding a user or group press enter or click on the check names button which will verify you have entered the correct name. In the event you have entered an incorrect name, an error message written in red will state that “no exact match was found”. Alternatively you can click on the browse button to bring up the Select People and Groups Webpage Dialog which allows you to enter a full or partial name, even as small as one letter, and perform a search to find the person or group you are looking for. To perform a search enter a name in the Find textbox and click on the search button. Double click on a user or select multiple users by clicking while holding control or shift and click on the Add-> button at the bottom of the Dialog to add the user(s). You can find and add as many users or groups as you like and then click OK to return to the Alert Me configuration page. 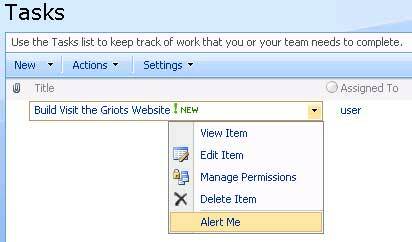 The remaining selections on the Alert Me page allow you to configure when and why you are to be alerted. In the Change Type section you can select from 4 different criteria such as to have an email alert on all changes or when existing items are modified. If you want to have alerts on two different Change Type criteria than you must create a completely new alert after completing the first one. You can create as many alerts as you want for any given SharePoint list and it is common to create many alerts for a given list to get only the alerts you are needing. Depending on the type of SharePoint list such as a Calendar or a Task list you have a selection of different possibilities to choose from. 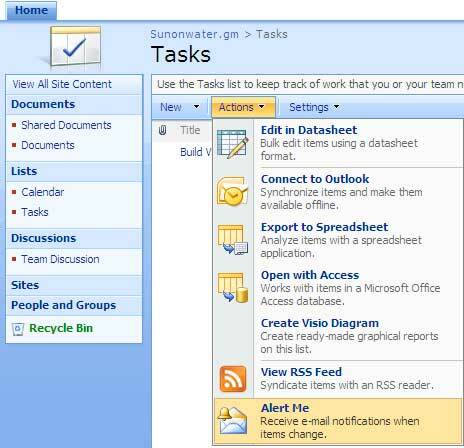 For a Task list you can can configure an alert to be sent with various criteria such as when “Anything changes” in the task or when “A high priority task changes”. With Alerts you can suffer from email overload so there are options to send a daily or weekly summary at a given time of day. To complete creating your alert press OK at the buttom of the page. An email will be sent to you account notifying you that your alert has been created. Setup alerts for only items that meet certain criteria, i.e. High priority open issues or only when a status changes to a certain value. Alter the text of the email Alert and insert fields from the list into the message. You can enhance SharePoint’s ShareAlert Me functionality with several 3rd party tools such as Pentalogic’s Reminder Web Part. I have a list with items having attachment. When I modify the list item, I do receive the alert mails. But if the attachment is modified, there is no alert coming. Kindly help. I have a question about the Alerts. I have an alert to send me an email immediately yet when there’s a submission that generates an alert it takes sometimes as much as an hour to get to me. 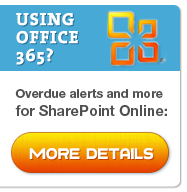 Is SharePoint queuing the Alerts and passing them to Exchange after a period of time or how does SharePoint work in regards to the sending out of alerts? Thx for your help. Be aware though that there are other things that can slow down how often the emails reach you – delays in your email infrastructure, lots of ‘heavy’ workflows slowing down the timer job etc.